The New Lending Services Price Index decreased by 1.6% in the third quarter following a 0.4% increase in the previous quarter. While increases in bond yields and the Bank of Canada policy interest rate in the third quarter contributed to the highest reference rate since 2011, interest rates charged increased at a slower pace and to a lesser extent. Business loan demand remained strong, while the demand for loans to individuals declined. The New Lending Services Price Index was down 0.4% in the third quarter compared with the same quarter in 2017. The New Lending Services Price Index (NLSPI) is not an index of loan rates paid by consumers and businesses, but represents the change in the price of service. Prices represent the difference between annual percentage rates for new loan products and averages of yields on financial market instruments. The variables used to calculate the prices are weighted annual percentage rates for new lending services, funds advanced by product, and market rates. New lending services include newly issued funds for personal loans, lines of credit, mortgage loans, business loans and leases. These data are combined with other data to estimate a price for new lending activity. Lending is one of the many services provided by the banking industry and this is the first in a suite of financial service indexes to be published. 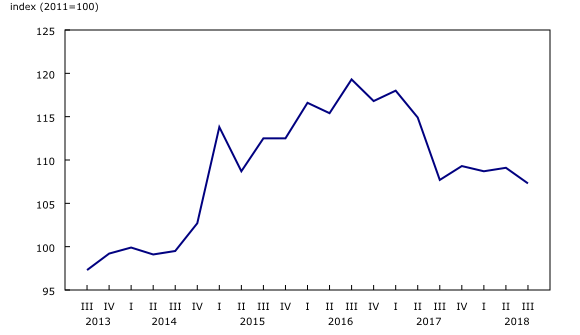 This index will provide better estimates of the real output, productivity and price change of financial services in Canada. With each release, data for the previous quarter may have been revised. The series is also subject to an annual revision with the release of second quarter data of the following reference year. The NLSPI is a monthly index that is disseminated on a quarterly basis. The index is not seasonally adjusted. Data are available at the national level only. For a more detailed explanation of the methodology, see the NLSPI " Methodology Summary Document."